Photo by Phil Zemke, Upstate NY, 2008. Photo by Diana Ayton-Shenker. Brooklyn, NYC, 2000. 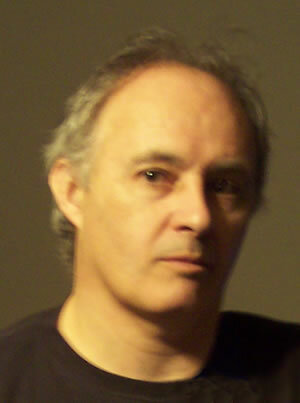 William T. Ayton was born in the north of England on 11/11/1958. After showing an early aptitude for drawing and painting (which originally came about from heavy exposure to American comic books), he went to Edinburgh College of Art to get a BA (Hons) in Fine Arts. After living in Edinburgh for a while, Ayton moved to Madrid, Spain with a girlfriend, where he taught English to make a living and had his first solo exhibitions. In 1990, he met Diana, who became his wife about a year after that. Together they came up with the idea for the Universal Declaration of Human Rights exhibition, which has been exhibited across the USA and Europe, and has been seen on TV in Spain & Canada. After they got married, they moved to Paris, France, where Ayton did some more English teaching & did some more art shows. Some of his paintings were featured on a cable TV program in Paris. They moved to Brooklyn, NY, and then to the Hudson Valley, where they now reside. 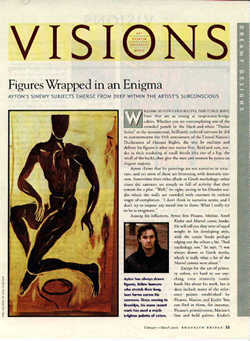 Ayton's work deals mainly with mythological subject matter, both classical and more contemporary. He draws deeply from his subconscious to create his images. The process is semi-automatic, as he rarely knows what the final result will be. Ayton's influences pull mainly from the surreal and proto-surreal tradition, but also, and less obviously, from the history of expressionism. 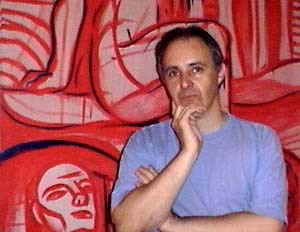 He tends to work in series of drawings and paintings: in 1998 he did the "Apocalypse" series, which ended up being not really about the end of the world. Most recently, he has been working on a series of paintings based on Rilke's "Duino Elegies", and another large-scale series entitled "The Black Paintings" (with no apologies to Francisco de Goya). Ayton has recently exhibited his War Room installations in 2 locations -- New York City & Poughkeepsie, NY, and intends to tour the exhibit nationally in the USA and internationally. 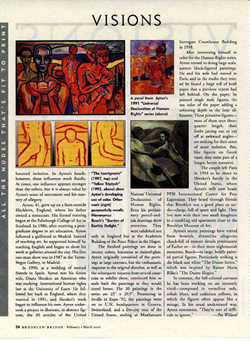 Below: article by Pat Willard from "Brooklyn Bridge" magazine, Feb-Mar 2000. "William Ayton's figurative paintings have lines that are as strong as suspension-bridge cables. Whether you are contemplating one of the crowded panels in the black-and-white "Duino Series" or the monumental, brilliantly colored canvases he did to commemorate the 45th anniversary of the United Nations Declaration of Human Rights, the way he outlines and defines his figures is what you notice first. Bold and sure, tender in their rendering of small details (the rise of a hip, the small of the back), they give the men and women he paints an elegant majesty." "Scenes from The Puppet Oresteia"
"Love, War, Fire, Wind: Looking Out from North America's Skull"
2004 Project Grant awarded to The War Room by Dutchess County Arts Council. 2003 Fiscal Sponsorship awarded to The War Room by The New York Foundation for the Arts (NYFA). 1998 Symposium: The Artist and Human Rights The National Arts Centre, Ottawa, Ontario. 1997 Fiscal Sponsorship awarded to The UDHR traveling exhibition by NYFA. 1980 MAGNOLIA National Student Landscape Competition 3rd Prize (U.K.).